Chemical engineering has often been referred to as a study in methodology. Approaches in chemical engineering are determined by individual phenomena/processes, and each of these are studied individually. The phenomena that are treated in chemical engineering can be classified into two groups: (1) phenomena that are definite and can be expressed by formulas such as differential equations (2) phenomena that can be expressed only by probability terms. 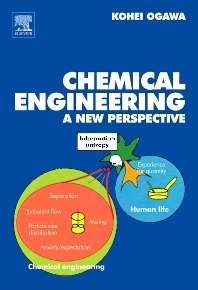 The focus of Chemical Engineering - A new Perspective is on "information entropy". The main themes covered are mixing, separation, turbulent structure, particle size distribution and degree of uncertainty. The book recognizes that the information entropy may not be the only viewpoint, and how the degree of information entropy is useful for the other phenomena.